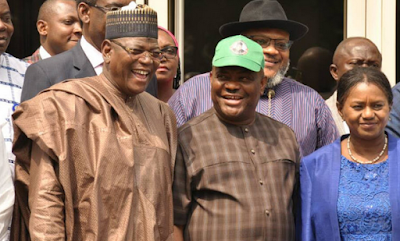 Rivers State Governor Nyesom Ezenwo Wike and former Jigawa State Governor Sule Lamido have flayed the Ekiti State governorship election. Wike, in a statement by his Special Assistant on Electronic Media Simeon Nwakaudu, said the poll was the worst political robbery in the nation’s democratic history. The governor said the APC-led Federal Government would not be able to replicate the “Ekiti political robbery in Rivers State because Rivers people are fully prepared”. Wike, who spoke yesterday at the Anglican Cathedral Church of Saint Paul, Port Harcourt during the Thanksgiving Service to mark the end of Third Year Anniversary Celebration of his administration, said: “Don’t be worried about what happened in Ekiti State. We are prepared. It will not happen here in Rivers State. “I have never experienced that kind of robbery in politics. I told my colleagues, do not give them any chance. Most of them in APC are happy that they will repeat the same thing in Rivers State. We are waiting, come and repeat. Let your spirit not be down, work hard and victory will be ours,” he said. Lamido, who is the presidential aspirant under the People’s Democratic Party (PDP), said: “The election process in Ekiti was heavily militarised; and I know it shouldn’t be a surprise because we are being led by a former military General ,who was also a former military Head of State, who was known for arresting political leaders. “Number two, you see, he (Buhari) only says politicians are this, politicians are that, which means he is not a politician. “So, I think the election in Ekiti, to me, if it is the wish of the people that is announced as the result, I have no quarrels with it. I hope, also, that this is not the kind of thing we are going to experience in 2019 elections because it will spell doom for democracy. He expressed confidence that PDP will reclaim power in 2019, adding that PDP has learnt from its past mistakes. » Justin Bieber Fan Tripping At Concert Not My Fault!! !